Srinagar, Jan 17 (KNS): Tehreek-e-Hurriyat Chairman, Mohammad Ashraf Sehrai on Thursday expressed his satisfaction over the release of Mushtaq-ul-Islam, saying they welcome his release and hope that this is just the start and the release of all ‘prisoners of conscience’ and political prisoners who have been detained for years for their political beliefs, and all those who have been detained for years without trials, and all others unless they are given fair trials according to international standards. “We view their groundless persecution as politically motivated harassment. Apart from that, we would like to hope that the release of Mushtaq-ul-Islam will be the first step towards improving the prisoners and human rights situation,” he said, adding that if those in power are serious and sincere and there is really a change of heart and approach then all political prisoners should be immediately released from jails and their freedom restored. 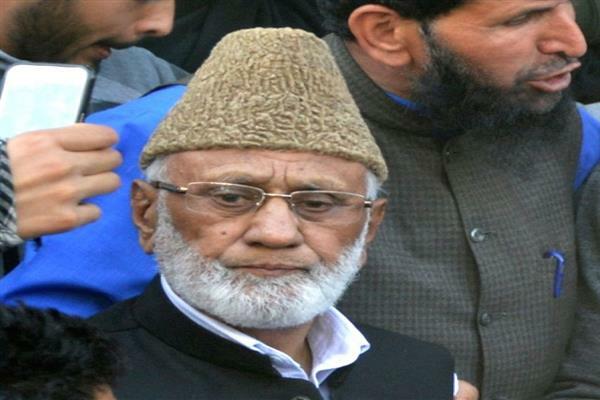 Sehrai said hundreds of Kashmiris are languishing in jails across India for their political ideology and beliefs even subjected to ill-treatment as policy of inflicting punishment upon them for their dissenting political views. “The draconian law, Public Safety Act (PSA), is invoked against the detainees on flimsy and baseless grounds at the will and whims of the authorities as and when they desire to keep them continuously in lockup,” he said. Meanwhile, Sehrai strongly condemned the ‘mental and physical torture’ of Ab Majeed Parray and Shahbaz Ahmed Mir of Hajin in police custody. He said severely thrashing of inmates is not only unacceptable but against the basic principles of humanity. “Kashmiri inmates are subjected to worst form inhuman behavior is a brazen violation of basic human rights,” he said.